The Phrygians (Al. Friganët, Gr. Φρύγες, Phruges or Phryges) were an ancient Indo-European people, initially dwelling in the southern Balkans – according to Herodotus – under the name of Bryges (Briges), changing it to Phruges after their final migration to Anatolia, via the Hellespont. Meanwhile, the Phrygian Kingdom was overwhelmed by Cimmerian invaders around 690 BC, then briefly conquered by its neighbour Lydia, before it passed successively into the Persian Empire of Cyrus the Great and the empire of Alexander and his successors, was taken by the Attalids of Pergamon, and eventually became part of the Roman Empire. The last mention of the language in literature dates to the fifth century CE and it was likely extinct by the seventh century. The Phrygians spoke an Indo-European language. Some contemporary historians, among which Strabo is the most known, consider the Phrygians a Thracian tribe, part of a wider "Thraco-Phrygian" group. Other linguists dismiss this hypothesis since Thracian (and hence Daco-Thracian) seem to belong to the Satem group of Indo-European languages, while Phrygian shared several similarities with other Indo-European languages of the Centum group (like Latin, Greek or the Anatolian languages). According to the latter group, of all the Indo-European languages, Phrygian seems to have been most closely linked to Greek, suggesting that the two languages belonged to the same dialectal subgroup of early Indo-European. Although the Phrygians adopted the alphabet originated by the Phoenicians and ultimately from Ancient Egyptians, only a few dozen inscriptions in the Phrygian language have been found, primarily funereal, and so much of what is thought to be known of Phrygia is second-hand information from Greek sources. A conventional date of c. 1180 BC is often used for the influx (traditionally from Thrace) of the pre-Phrygian Bryges or Mushki, corresponding to the very end of the Hittite empire. Following this date, Phrygia retained a separate cultural identity. E. g. in classical Greek iconography the Trojan Paris is represented as non-Greek by his Phrygian cap, which was worn by Mithras and survived into modern imagery as the "Liberty cap" of the American and French revolutionaries. Phrygia developed an advanced Bronze Age culture. The earliest traditions of Greek music are in part connected to Phrygian music, transmitted through the Greek colonies in Anatolia, especially the Phrygian mode, which was considered to be the warlike mode in ancient Greek music. Phrygian Midas, the king of the "golden touch", was tutored in music by Orpheus himself, according to the myth. Another musical invention that came from Phrygia was the aulos, a reed instrument with two pipes. Marsyas, the satyr who first formed the instrument using the hollowed antler of a stag, was a Phrygian follower of Cybele. He unwisely competed in music with the Olympian Apollo and inevitably lost, whereupon Apollo flayed Marsyas alive and provocatively hung his skin on Cybele's own sacred tree, a pine. ​Inscriptions found at Gordium make clear that Phrygians spoke an Indo-European language with at least some vocabulary similar to Greek, and clearly not belonging to the family of Anatolian languages spoken by most of Phrygia's neighbors. One of the so-called Homeric Hymns describes the Phrygian language as not mutually intelligible with that of Troy. According to ancient tradition among Greek historians, the Phrygians anciently migrated to Anatolia from the Balkans. Herodotus says the Phrygians were called Bryges when they lived in Europe. He and other Greek writers also recorded legends about King Midas that associated him with or put his origin in Macedonia; Herodotus, for example, says a wild rose garden in Macedonia was named after Midas. Some classical writers also connected the Phrygians with the Mygdones, the name of two groups of people, one of which lived in northern Macedonia and another in Mysia. Likewise the Phrygians have been identified with the Bebryces, a people said to have warred with Mysia before the Trojan War and who had a king named Mygdon at roughly the same time as the Phrygians were said to have had a king named Mygdon. The classical historian Strabo groups Phrygians, Mygdones, Mysians, Bebryces and Bithynians together as peoples that migrated to Anatolia from the Balkans. This image of Phrygians as part of a related group of northwest Anatolian cultures seems the most likely explanation for the confusion over whether Phrygians, Bebryces and Anatolian Mygdones were or were not the same people. The apparent similarity of the Phrygian language to Greek and its dissimilarity with the Anatolian languages spoken by most of their neighbors is also taken as support for a European origin of the Phrygians. Phrygian continued to be spoken until sixth century AD, though its distinctive alphabet was lost earlier than those of most Anatolian cultures. Some scholars have theorized that such a migration could have occurred more recently than classical sources suggest, and have sought to fit the Phrygian arrival into a narrative explaining the downfall of the Hittite Empire and the end of the high Bronze Age in Anatolia. According to this "recent migration" theory, the Phrygians invaded just before or after the collapse of the Hittite Empire at the beginning of the 12th century BC, filling the political vacuum in central-western Anatolia, and may have been counted among the "Sea Peoples" that Egyptian records credit with bringing about the Hittite collapse. The so-called Handmade Knobbed Ware found in Western Anatolia during this period has been tentatively identified as an import connected to this invasion. However, most scholars reject such a recent Phrygian migration and accept as factual the Iliad's account that the Phrygians were established on the Sakarya River before the Trojan War, and thus must have been there during the later stages of the Hittite Empire, and probably earlier. These scholars seek instead to trace the Phrygians' origins among the many nations of western Anatolia who were subject to the Hittites. This interpretation also gets support from Greek legends about the founding of Phrygia's main city Gordium by Gordias and of Ancyra by Midas, which suggest that Gordium and Ancyra were believed to be date from the distant past before the Trojan War. Some scholars dismiss the claim of a Phrygian migration as a mere legend, likely arising from the coincidental similarity of their name to the Bryges. No one has conclusively identified which of the many subjects of the Hittites might have represented early Phrygians. According to a classical tradition, popularized by Josephus, Phrygia can be equated with the country called Togarmah by the ancient Hebrews, which has in turn been identified as the Tegarama of Hittite texts and Til-Garimmu of Assyrian records. Josephus called Togarmah "the Thrugrammeans, who, as the Greeks resolved, were named Phrygians". However, the Greek source cited by Josephus is unknown, and it is unclear if there was any basis for the identification other than name similarity. Scholars of the Hittites believe Tegarama was in eastern Anatolia - some locate it at Gurun - far to the east of Phrygia. Some scholars have identified Phrygia with the Assuwa league, and noted that the Iliad mentions a Phrygian (Queen Hecuba's brother) named Asios. Another possible early name of Phrygia could be Hapalla, the name of the easternmost province that emerged from the splintering of the Bronze Age western Anatolian empire Arzawa. However, scholars are unsure if Hapalla corresponds to Phrygia or to Pisidia, further south. Herodotus also claims that Phrygian colonists founded the Armenian nation. This is likely a reference to a third group of people called Mygdones living in northern Mesopotamia who were apparently allied to the Armenians; Xenophon describes them in his Anabasis in a joint army with the Armenians. However, little is known about these eastern Mygdones, and no evidence of Phrygian language in that region has been found. Eric P. Hamp in his 2012 Indo-European family tree classified the Phrygian language together with Italo-Celtic as member of a member of a "Northwest Indo-European" group. In Hamp's view, Northwest Indo-Europeans are likely to have been the first inhabitants of Hallstatt with the Pre-Phrygians moving east and south to Anatolia in the same manner as the Galatians do later. Raymund Carl in 2010 mentions that the Lausitz culture was one such Hallstatt-associated culture. According to the Iliad, the homeland of the Phrygians was on the Sangarius River, which would remain the centre of Phrygia throughout its history. Phrygia was famous for its wine and had "brave and expert" horsemen. According to the Iliad, before the Trojan War, a young king Priam of Troy had taken an army to Phrygia to support it in a war against the Amazons. Homer calls the Phrygians "the people of Otreus and godlike Mygdon. According to Euripides, Quintus Smyrnaeus and others, this Mygdon's son, Coroebus, fought and died in the Trojan War; he had sued for the hand of the Trojan princess Cassandra in marriage. The name Otreus could be an eponym for Otroea, a place on Lake Ascania in the vicinity of the later Nicaea, and the name Mygdon is clearly an eponym for the Mygdones, a people said by Strabo to live in northwest Asia Minor, and who appear to have sometimes been considered distinct from the Phrygians. However, Pausanias believed that Mygdon's tomb was located at Stectorium in the southern Phrygian highlands, near modern Sandikli. According to the Bibliotheca, the Greek hero Heracles slew a king Mygdon of the Bebryces in a battle in northwest Anatolia that if historical would have taken place about a generation before the Trojan War. According to the story, while traveling from Minoa to the Amazons, Heracles stopped in Mysia and supported the Mysians in a battle with the Bebryces. According to some interpretations, Bebryces is an alternate name for Phrygians and this Mygdon is the same person mentioned in the Iliad. King Priam married the Phrygian princess Hecabe (or Hecuba) and maintained a close alliance with the Phrygians, who repaid him by fighting "ardently" in the Trojan War against the Greeks. Hecabe was a daughter of the Phrygian king Dymas, son of Eioneus, son of Proteus. According to the Iliad, Hecabe's younger brother Asius also fought at Troy (see above); and Quintus Smyrnaeus mentions two grandsons of Dymas that fell at the hands of Neoptolemus at the end of the Trojan War: "Two sons he slew of Meges rich in gold, Scion of Dymas - sons of high renown, cunning to hurl the dart, to drive the steed in war, and deftly cast the lance afar, born at one birth beside Sangarius' banks of Periboea to him, Celtus one, and Eubius the other." Teleutas, father of the maiden Tecmessa, is mentioned as another mythical Phrygian king. There are indications in the Iliad that the heart of the Phrygian country was further north and downriver than it would be in later history. The Phrygian contingent arrives to aid Troy coming from Lake Ascania in northwest Anatolia, and is led by Phorcys and Ascanius, both sons of Aretaon. In one of the so-called Homeric Hymns, Phrygia is said to be "rich in fortresses" and ruled by "famous Otreus". The ruins of Gordion and Midas City prove that Phrygia had developed an advanced Bronze Age culture. This Phrygian culture interacted in a number of ways with Greek culture in various periods of history. The "Great Mother", Cybele, as the Greeks and Romans knew her, was originally worshiped in the mountains of Phrygia, where she was known as "Mountain Mother". In her typical Phrygian form, she wears a long belted dress, a polos (a high cylindrical headdress), and a veil covering the whole body. The later version of Cybele was established by a pupil of Phidias, the sculptor Agoracritus, and became the image most widely adopted by Cybele's expanding following, both in the Aegean world and at Rome. It shows her humanized though still enthroned, her hand resting on an attendant lion and the other holding the tympanon, a circular frame drum, similar to a tambourine. The Phrygians also venerated Sabazios, the sky and father-god depicted on horseback. Although the Greeks associated Sabazios with Zeus, representations of him, even at Roman times, show him as a horseman god. His conflicts with the indigenous Mother Goddess, whose creature was the Lunar Bull, may be surmised in the way that Sabazios' horse places a hoof on the head of a bull, in a Roman relief at the Museum of Fine Arts, Boston. The earliest traditions of Greek music derived from Phrygia, transmitted through the Greek colonies in Anatolia, and included the Phrygian mode, which was considered to be the warlike mode in ancient Greek music. Phrygian Midas, the king of the "golden touch", was tutored in music by Orpheus himself, according to the myth. Another musical invention that came from Phrygia was the aulos, a reed instrument with two pipes. Marsyas, the satyr who first formed the instrument using the hollowed antler of a stag, was a Phrygian follower of Cybele. He unwisely competed in music with the Olympian Apollo and inevitably lost, whereupon Apollo flayed Marsyas alive and provocatively hung his skin on Cybele's own sacred tree, a pine. 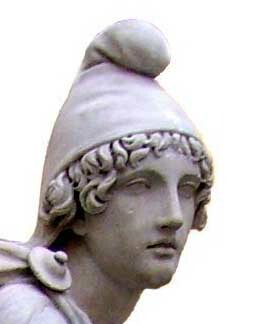 Classical Greek iconography identifies the Trojan Paris as non-Greek by his Phrygian cap, which was worn by Mithras and survived into modern imagery as the "Liberty cap" of the American and French revolutionaries. The Phrygians spoke an Indo-European language. (See Phrygian language.) Although the Phrygians adopted the alphabet originated by the Phoenicians, only a few dozen inscriptions in the Phrygian language have been found, primarily funereal, and so much of what is thought to be known of Phrygia is second-hand information from Greek sources. The name of the earliest known mythical king was Nannacus (aka Annacus). This king resided at Iconium, the most eastern city of the kingdom of Phrygia at that time; and after his death, at the age of 300 years, a great flood overwhelmed the country, as had been foretold by an ancient oracle. The next king mentioned in extant classical sources was called Manis or Masdes. According to Plutarch, because of his splendid exploits, great things were called "manic" in Phrygia. Thereafter the kingdom of Phrygia seems to have become fragmented among various kings. One of the kings was Tantalus who ruled over the north western region of Phrygia around Mount Sipylus. Tantalus was endlessly punished in Tartarus, because he allegedly killed his son Pelops and sacrificially offered him to the Olympians, a reference to the suppression of human sacrifice. Tantalus was also falsely accused of stealing from the lotteries he had invented. In the mythic age before the Trojan war, during a time of an interregnum, Gordius (or Gordias), a Phrygian farmer, became king, fulfilling an oracular prophecy. The kingless Phrygians had turned for guidance to the oracle of Sabazios ("Zeus" to the Greeks) at Telmissus, in the part of Phrygia that later became part of Galatia. They had been instructed by the oracle to acclaim as their king the first man who rode up to the god's temple in a cart. That man was Gordias (Gordios, Gordius), a farmer, who dedicated the ox-cart in question, tied to its shaft with the "Gordian Knot". Gordias refounded a capital at Gordium in west central Anatolia, situated on the old trackway through the heart of Anatolia that became Darius's Persian "Royal Road" from Pessinus to Ancyra, and not far from the River Sangarius. Man in Phrygian costume,Hellenistic period (3rd–1st century BC),CyprusThe Phrygians are associated in Greek mythology with the Dactyls, minor gods credited with the invention of iron smelting, who in most versions of the legend lived at Mount Ida in Phrygia. Gordias's son (adopted in some versions) was Midas. A large body of myths and legends surround this first king Midas. connecting him with a mythological tale concerning Attis. This shadowy figure resided at Pessinus and attempted to marry his daughter to the young Attis in spite of the opposition of his lover Agdestis and his mother, the goddess Cybele. When Agdestis and/or Cybele appear and cast madness upon the members of the wedding feast. Midas is said to have died in the ensuing chaos. King Midas is said to have associated himself with Silenus and other satyrs and with Dionysus, who granted him a "golden touch". In one version of his story, Midas travels from Thrace accompanied by a band of his people to Asia Minor to wash away the taint of his unwelcome "golden touch" in the river Pactolus. Leaving the gold in the river's sands, Midas found himself in Phrygia, where he was adopted by the childless king Gordias and taken under the protection of Cybele. Acting as the visible representative of Cybele, and under her authority, it would seem, a Phrygian king could designate his successor. The Phrygian Sibyl was the priestess presiding over the Apollonian oracle at Phrygia. According to Herodotus, the Egyptian pharaoh Psammetichus II had two children raised in isolation in order to find the original language. The children were reported to have uttered bekos which is Phrygian for "bread", so Psammetichus admitted that the Phrygians were a nation older than the Egyptians. After the collapse of the Hittite Empire at the beginning of the twelfth century BC, the political vacuum in central-western Anatolia was filled by a wave of Indo-European migrants and "Sea Peoples", including the Phrygians, who established their kingdom with a capital eventually at Gordium. It is presently unknown whether the Phrygians were actively involved in the collapse of the Hittite capital Hattusa or whether they simply moved into the vacuum left by the collapse of Hittite hegemony. The so-called Handmade Knobbed Ware was found by archaeologists at sites from this period in Western Anatolia. According to Greek mythographers,the first Phrygian Midas had been king of the Moschi (Mushki), also known as Bryges (Brigi) in the western part of archaic Thrace. Assyrian sources from the 8th century BC speak of a king Mita of the Mushki, identified with king Midas of Phrygia. An Assyrian inscription records Mita as an ally of Sargon of Assyria in 709 BC. A distinctive Phrygian pottery called Polished Ware appears in the 8th century BC. The Phrygians founded a powerful kingdom which lasted until the Lydian ascendancy (7th century BC). Under kings alternately named Gordias and Midas, the independent Phrygian kingdom of the 8th and 7th centuries BC maintained close trade contacts with her neighbours in the east and the Greeks in the west. Phrygia seems to have been able to co-exist with whatever power was dominant in eastern Anatolia at the time. Detail from a reconstruction of a Phrygian building at Pararli, Turkey, seventh to sixth century BC; Museum of Anatolian Civilizations, Ankara: A griffin, sphinx and two centaurs are shown.The invasion of Anatolia in the late 8th century BC to early 7th century BC by the Cimmerians was to prove fatal to independent Phrygia. Cimmerian pressure and attacks culminated in the suicide of its last king, Midas, according to legend. Gordium fell to the Cimmerians in 696 BC and was sacked and burnt, as reported much later by Herodotus. A series of digs have opened Gordium as one of Turkey's most revealing archeological sites. Excavations confirm a violent destruction of Gordion around 675 BC. A tomb of the Midas period, popularly identified as the "Tomb of Midas" revealed a wooden structure deeply buried under a vast tumulus, containing grave goods, a coffin, furniture, and food offerings (Archaeological Museum, Ankara). The Gordium site contains a considerable later building program, perhaps by Alyattes, the Lydian king, in the 6th century BC. Minor Phrygian kingdoms continued to exist after the end of the Phrygian empire, and the Phrygian art and culture continued to flourish. Cimmerian people stayed in Anatolia but do not appear to have created a kingdom of their own. The Lydians repulsed the Cimmerians in the 620s, and Phrygia was subsumed into a short-lived Lydian empire. The eastern part of the former Phrygian empire fell into the hands of the Medes in 585 BC. Under the proverbially rich King Croesus (reigned 560–546 BC), Phrygia remained part of the Lydian empire that extended east to the Halys River. There may be an echo of strife with Lydia and perhaps a veiled reference to royal hostages, in the legend of the twice-unlucky Adrastus, the son of a King Gordias with the queen, Eurynome. He accidentally killed his brother and exiled himself to Lydia, where King Croesus welcomed him. Once again, Adrastus accidentally killed Croesus' son and then committed suicide. Lydian Croesus was conquered by Cyrus in 546 BC, and Phrygia passed under Persian dominion. After Darius became Persian Emperor in 521 BC, he remade the ancient trade route into the Persian "Royal Road" and instituted administrative reforms that included setting up satrapies (provinces). In the 5th century, Phrygia was made into two administrative provinces, that of Hellespontine Phrygia (or Lesser Phrygia), with its provincial capital established at Dascylium, and the province of Greater Phrygia. Under Persian rule, the Phrygians seem to have lost their intellectual acuity and independence. Phrygians became stereotyped among later Greeks and the Romans as passive and dull. Phrygians remained subjects to the Hellenistic kingdoms that ruled the area and later to the Roman Empire, but the Phrygians retained their culture and their language until it became extinct in the 5th Century. Swain, Simon; Adams, J. Maxwell; Janse, Mark (2002). Bilingualism in ancient society: language contact and the written word. Oxford [Oxfordshire]: Oxford University Press. pp. 246–266. ISBN 0-199-24506-1. Claude Brixhe, Phrygian, in Roger D. Woodard (editor), The ancient Languages of Asia Minor, Cambridge University Press, 2008, p. 72. Suidas s. v. Νάννακος; Stephanus of Byzantium s.v. Ἰκόνιον; Both passages are translated in: "A New System: or, An Analysis of Antient Mythology" by Jacob Bryant (1807): 12-14. Plutarch, "On Isis and Osiris", chap. 24. JG MacQueen, The Hittites and their contemporaries in Asia Minor, 1986, p. 157. Drews, Robert (1995). The end of the Bronze Age: changes in warfare and the catastrophe ca. 1200 B.C. Princeton University Press. p. 65. ISBN 9780691025919.